More and more men are maintaining or improving their good looks through plastic surgery procedures and subtle non-surgical treatments. In fact, the number of cosmetic procedures performed for men has increased by over 273% over the last 15 years! Here at Little Rock Cosmetic Surgery Center, we have many years of experience working with male patients to achieve subtle, natural, and masculine-looking cosmetic results, and we offer a variety of procedures and treatments that are tailored to the unique needs and goals of men. When it comes to cosmetic surgery, men and women typically have very different concerns and desired outcomes. That’s why it is important to work with a surgeon and cosmetic team that have the skill and knowledge to provide optimal results for men. Dr. Branman and his expert staff have an advanced understanding of male anatomy and work closely with each individual patient to design a treatment plan that best meets your needs. 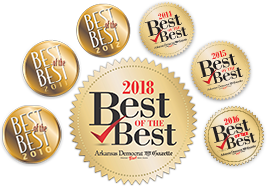 Whether you are hoping to reduce visible signs of aging with minimally invasive treatments or make a more permanent improvement to your body or facial contours through plastic surgery, Little Rock Cosmetic Surgery Center has you covered. We offer a variety of services designed to address the most common concerns among male patients. Learn more about our most popular male procedures below. Did you know that an estimated 40% of American men suffer from gynecomastia, or enlarged male breasts? While weight loss can sometimes help, in the case of a condition called Male EBT™, or Male Excess Breast Tissue, surgery is a more effective option. Male breast reduction removes excess male breast tissue and fat to restore a firmer, flatter chest appearance. Liposuction is consistently the most popular cosmetic procedure among both men and women, for good reason. Men most often carry excess fat in the waist, flank, and back, and liposuction for men is often the best option for permanently reducing fatty bulges, highlighting underlying musculature, and sculpting a more masculine, sharper body contour. Dr. Branman also offers VASER liposuction to improve results and minimize downtime through the application of ultrasonic energy. Men also often benefit from the inclusion of upper and lower eyelid surgery, which serves to enhance SmartLift results. Eyelid surgery can reduce sagging skin around the eyes, virtually eliminate under-eye baggage, and will give men a more alert appearance. Injectable filler treatments are quickly becoming one of the most popular options for reducing visible signs of aging and restoring a smoother, more youthful appearance to the face. BOTOX® for men, often referred to as “Brotox,” is a great way to minimize the angry or concerned appearance that is common among men as deep creases develop in the upper face. Dermal fillers, such as Juvéderm® and Restylane®, can help reduce deep nasolabial folds and marionette lines around the nose and mouth, further helping to create a younger, more defined appearance. Traditionally, a sharp face with strong features is seen as the epitome of masculinity. For men who have a naturally weaker chin or who have noticed the definition of their jawline changing as they’ve aged, chin augmentation surgery can strengthen the chin and bring balance to the entire face. By placing custom-fitted chin implants, Dr. Branman is able to add projection to the chin, which strengthens the appearance of the jawline in addition to improving overall proportion and appearance of the face. Bothered by the size or shape of your nose? Worried about a bump or slanted bridge? Rhinoplasty can help men achieve a more balanced, harmonious appearance by improve the overall shape and size of the nostrils, bridge, and nose tip. Unwanted body hair isn’t only frustrating, it can also be embarrassing. Through a series of comfortable laser hair removal treatments, men can permanently get rid of unwanted hair—and put down the razor for good. The most popular treatment areas for men are the ears, back, and chest, though we can safely remove hair from almost anywhere on the face or body. If you’re considering a male plastic surgery procedure in Little Rock, or you’re curious to learn more about available options, contact us to schedule your personal consultation with Dr. Branman. Together, you’ll explore your options, discuss your procedures of interest, and come up with a plan to help you achieve your optimal results.